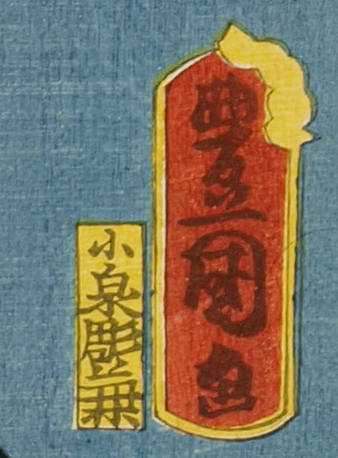 People sometimes say to us: “what is a Toshidama?” The characteristic round seal seen on many nineteenth century Japanese prints is called a Toshidama Seal. It was used at some point by most artists of the Utagawa School. At first it looks like the silhouette of a diamond ring with four stones; what it actually represents is a twist of cloth with four coins inside it and it is called a Toshidama or Otoshidama. The tradition comes from a ritual in which round rice cakes were offered to the god of the year; some of the cakes were also distributed and eaten by worshippers and their families. The word derives from tama, meaning round and also spirit. The toshidama is an emblem of good fortune and first appears in around 1808 in the work of Toyokuni I, the founder of the Utagawa School. 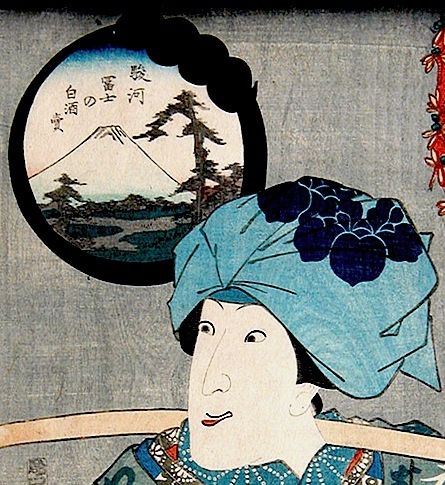 The symbol was developed by his pupil, the famous and prolific Kunisada, (later Toyokuni III). Toyohara Kunichika used it extensively throughout his career in almost every print. As can be seen in these examples, the device was sometimes stretched to form a rectangle and often contained writing, pictures or small landscapes. Over time the tradition of gift giving to children at New Year was developed and the Toshidama came to mean something else entirely. In Japan children are often given small envelopes containing money instead of twists of material. 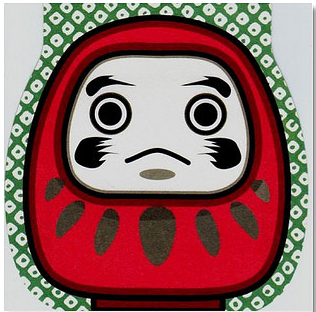 These are now mass produced and are printed with cartoon characters or emblems of Daruma (the founder of Zen Buddhism), the pine tree or the plum which are all emblems of good luck. The video below is an example of how the contemporary Toshidama gift should be prepared. This entry was posted in Japanese Art Gallery, Japanese prints, japanese woodblock prints, Kunichika, Kunisada, Toshidama Gallery., ukiyo-e art, utagawa and tagged floating world, Japanese prints, Japanese Woodblock Prints, Kunichika print, Kunisada, Ukiyo-e, Utagawa School. Bookmark the permalink.